With the release of 2014 Global Financial Inclusion Data (Global Findex) in April 2015, the champions of financial inclusion have every right to celebrate. The data says several exciting things, firstly, that account penetration is deepening, secondly, the number of the banked has risen by over 500 million, and thirdly, mobile money has taken root as a very critical financial service in sub-Saharan Africa. But perhaps the most important piece of information that this data seems to provide to stakeholders and players in the housing sector in Africa, is that more funds are similarly flowing into housing. As a starting point to this discussion, we look at the number of persons with accounts at financial institutions as reported by Findex. 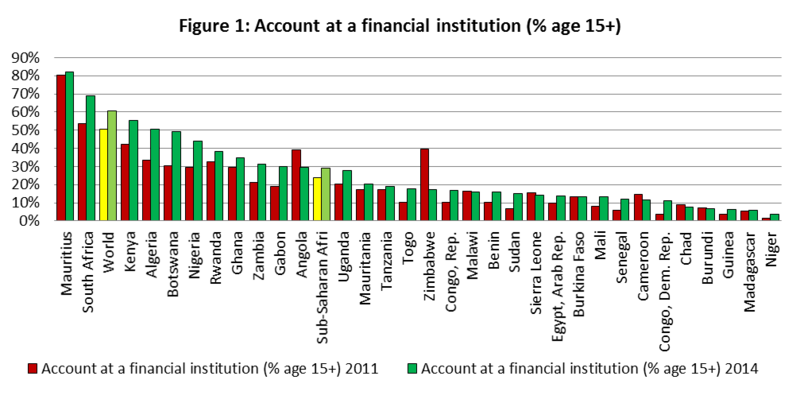 In 2011, Findex reports the percentage of respondents with an account (self or together with someone else) at a bank, credit union, another financial institution (e.g., cooperative, microfinance institution), or the post office (if applicable) including respondents who reported having a debit card (% age 15+). In 2014, they report the percentage of respondents who report having an account (by themselves or together with someone else) at a bank or another type of financial institution; having a debit card in their own name; receiving wages, government transfers, or payments for agricultural products into an account at a financial institution in the past 12 months; paying utility bills or school fees from an account at a financial institution in the past 12 months; or receiving wages or government transfers into a card in the past 12 months (% age 15+). These two indicators are very similar and Findex treats them so in explaining the change in financial inclusion. 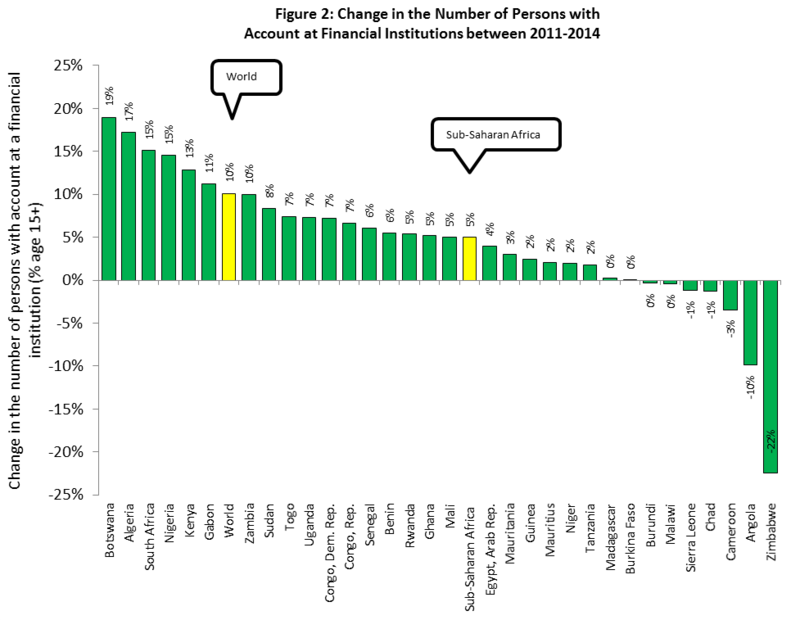 The results presented in Figure 1, below, indicate that financial inclusion in most African countries is still relatively low compared to the world’s average – only Mauritius and South Africa have an average that is above the world’s average. Despite having an overall lower penetration of financial services, Findex shows the transition from 2011 to 2014 has been positive in most African countries. The change in the percentages of respondents that report having an account at a financial institution is positive for all countries except Burundi, Malawi, Sierra Leone, Chad, Cameroon, Angola and Zimbabwe. 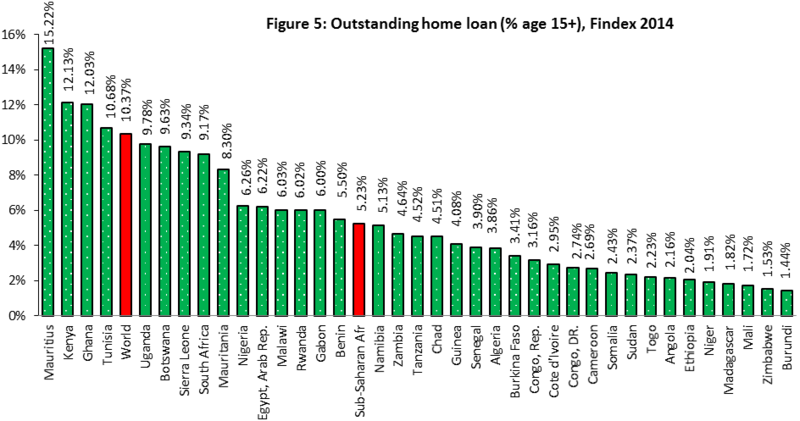 In fact, Findex shows that Botswana (with about 19% increase), Algeria (17% increase), South Africa (17%), Nigeria (13%) and Kenya (11%) had a growth in the banked population above the world’s average. Around the globe, the increase was established at 10% (among the population of 15 years and above), which translates to over 500 million new accounts. In Africa, the growth amounts to over 35 million new accounts in this age group. A positive growth in number of banked, as reported for Africa, is an important step towards the potential for home ownership because having an account with a financial institution provides one with a platform through which other financial products such as an ordinary personal or mortgage loan can be accessed. Indeed, Findex data appears to support this assertion. 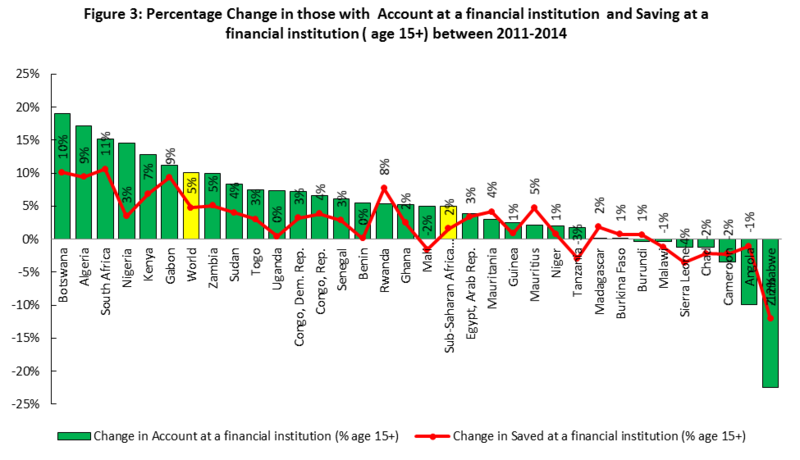 Accordingly, growth in the number of banked seem to be followed closely with number of people using banks for savings in most sub-Saharan African countries as shown by Figure 3, below. An increase in savings is vital to the housing market because savings support the borrower’s potential equity base that is available; and this in turn, enhances their access to housing finance. Most financial institutions seek a down payment of upwards of 20% of the value of the house, before granting a mortgage loan to cover the remaining 80%. With a positive change in savings in most sub-Saharan African countries, one would expect that financial institutions are enabled to provide more credit in 2014 into the housing market than in 2011. 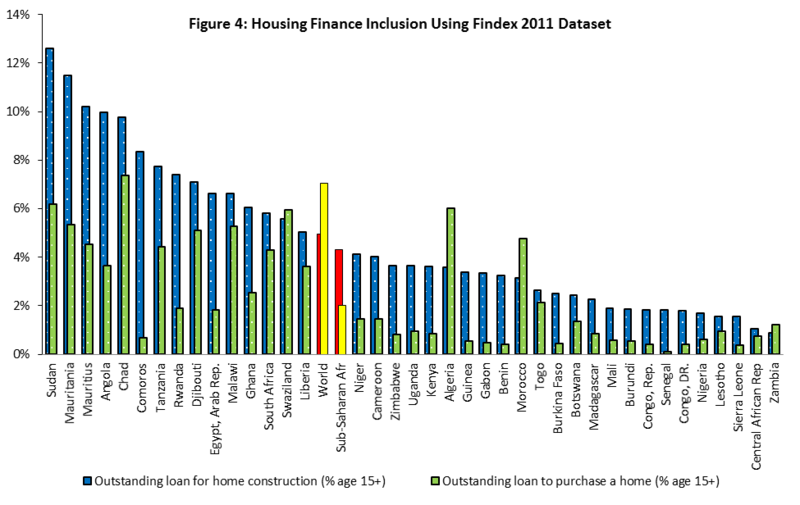 Unfortunately, Findex data allows comparisons of housing finance penetration across countries only. It does not permit comparisons across time because the indicators measured in 2011 are different from the indicator used in 2014. The Findex survey of 2011, included two housing-related data points: ‘outstanding loan for home construction’, which was said to denote the percentage of respondents who report to having an outstanding loan to purchase materials or services to build, extend, or renovate their home or apartment, and ‘outstanding loan to purchase a home’, denoting the percentage of respondents who report to having an outstanding loan to purchase their home or apartment. The 2011 questionnaire suggests that these indicators captured outstanding formal and informal housing credit. In 2014, Findex provides data on what they call ‘outstanding mortgage loans’, defined as including all forms of formal housing-related credit from financial institutions. Informal housing-related credit is not counted. The 2014 indicator is therefore an entirely separate data point which cannot be construed as a combination of the previous two data points. As such, one cannot derive a sense of progress or change between the 2011 survey and 2014 survey. The major strength of the 2011 dataset, especially for Africa, is the fact that the focus was more on the purpose/objective of loan rather than the source of the loan. The acknowledgement of informal and non-mortgage housing finance is important borrowing ordinary (unsecured) loans to build houses and borrowing from informal groups, friends and other savings groups for house construction or renovations, which may take a form of incremental construction, are common practices in Africa where cost of formal credit is high. Only a very small proportion of the population uses mortgage loans and formal housing microloans. The result of such broad definition emerges so easily when you look at the proportion of respondents that attest to having outstanding loans for housing purposes using 2011 data. According to Findex 2011, the world’s averages were about 4.96% and 7.04% whereas for sub-Saharan Africa, the averages were 2.01% and 4.32% for ‘outstanding loan to purchase a home’ and ‘outstanding loan for home construction’, respectively. Despite the shortcoming of the 2014 data, it is delivered in over four dimensions which provide a deeper insight into housing lending by revealing the profile of the major borrowers in terms of gender, income, and whether rural or urban. For instance, if we start with the proportion of formal home loans against the total population above 15 years, using Figure 5 below, we can see that this data suggest an average of about 5% of the population (15 years and above), in sub-Saharan Africa, who confirm to having outstanding home loans, presumably comprising both mortgage and non-mortgage loans. That being the case, this data points towards little housing finance from financial institutions in Africa compared to financial institutions in the rest of the world. 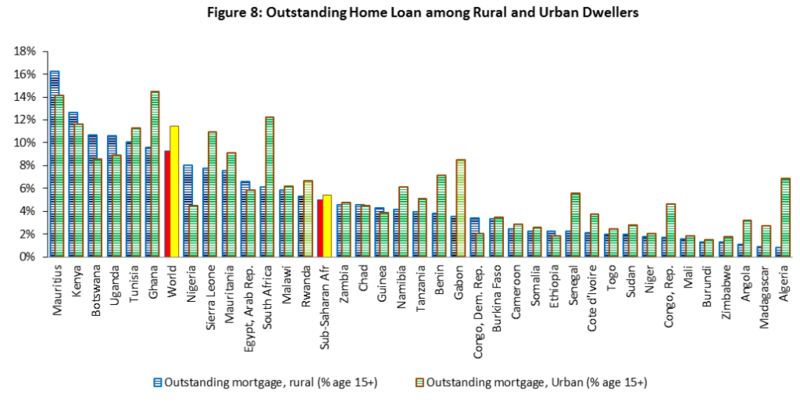 At the same time, it shows that Mauritius, Kenya, Ghana and Tunisia, which reported home loan rates that exceed the world’s average, could be having the highest outstanding housing credit in Africa. By examining the indicator of housing finance further in terms of gender, age, income and whether rural or urban, Findex provides very important categorization that can help identify market segments that are underserved. Figure 6 below shows that in most countries, more men say they have an outstanding home loan than women, in all but ten countries across the continent. In terms of income, Findex segments the population into the richest 60% and the poorest 40% of the population. From the graph below, Findex confirms that housing loans are more popular among the rich than among the poor. Across Africa, with exception of Burkina Faso, Niger, Nigeria and Sierra Leone, more respondents report to having outstanding home loans among the wealthiest 60% than among the poorest 40%. This raises affordability concerns which, for a while, have been a major challenge to housing policymakers. In most African countries, it is common to find the highest demand for decent housing among the poor, then again, because of affordability challenges; very few would afford to pay for a decent house. In fact, an average of 3.8% for sub-Saharan Africa as suggested by Findex data in the figure below is likely to attract a lot of contradicting opinions. Regarding rural and urban disparities, Findex data suggests that even though urban dwellers seem to borrow more than rural dwellers in most countries, the reverse appears to be true in about 10 African countries. This inference is rather surprising given the tenure situation and the lack of mortgagable titles in most rural areas across the continent. Most practitioners and stakeholders in housing finance are of a view that housing finance is an urban phenomenon which casts doubt on what really was measured by these indicators. In summary, despite a much celebrated increase in financial inclusion around the world, there are still very real challenges in enabling access to housing finance in Africa. One of the most obvious challenges has to do with the data that we use to understand the problem. It is unfortunate that the 2014 Findex does not offer an opportunity for a longitudinal view, but in time that should not be a concern if the data is collected consistently. However, more concerted effort between agencies is needed to ensure precision in data collection, so that we know what we’re actually measuring. Collected data should address the uniqueness of housing finance in Africa and still provide sufficient data for comparison along time and country-wise. One of the most important issues to be considered should be the understanding of what constitutes housing finance in Africa by the respondents or sources of data. It will yield more reliable results if housing finance in Africa is viewed as any credit used to build or purchase a home, as was the case in 2011. Fixation on mortgage loans is inappropriate and misleading. Amidst the seemly gloomy pictures, the data also suggests opportunities for improvement. Sub-Saharan African mortgage markets are tiny, but also ripe for growth, whether we go by Findex, World Bank, Hofinet, or other datasets. Much is already being done, for instance, liquidity facilities in Tanzania, Nigeria, Egypt and the CEMAC region offer opportunities for growth, and changes in the subsidy policies in South Africa are some of the structural changes likely to bring about a demand for housing finance in these countries. In addition, and perhaps the main contribution of the Findex data, there are several neglected segments where more focused lending could be directed such as females, rural dwellers and the middle class as new profitable market segments. Although, a word of caution is necessary, lessons can be learnt from those who have pioneered lending in these segments instead of neglecting these exciting segments of potential growth entirely. In 2011 questionnaire, question 14 asks whether one, in the past 12 months, had borrowed any money from a financial institution, microfinance institution, store, family, friends, employer or “informal money lenders”. Then question 15 asks whether one had any loan taken to purchase a home or apartment; to purchase materials or services to build, extend, or renovate a home or apartment; to pay school fees; for emergency/health purposes or for funerals or weddings. Hi Sabata, there are various types of housing finance. Are you looking for a micro loan or a mortgage? Accessing finance in Africa depends on the country. Please refer to our annual publication, the Housing Finance in Africa Yearbook, 2016 which will provide you with more information on access to finance and housing markets in 51 countries in Africa. The link to the Yearbook is http://staging.signpost.co.za/housingfinanceafrica-old/document/2016-housing-finance-in-africa-yearbook/. You can choose which country you are interested in buying a house in and read up on the access to finance in that country. This will help direct you. Once you have done this please refer back to us for more clarity and we will help put you in touch with relevant points of contact where possible.